The 3-9x42 Contour Riflescope (Black Matte) from Barska combines performance and innovation in a compact scope without sacrificing dependability, durability or workmanship. Offering low magnification with reasonable eye relief, this riflescope is ideal for AR-15, M-16, crossbows, pistols, and more. Engineered with rigid shockproof construction, the Contour can even handle the demands of shotguns and other high recoil weapons. This 3-9x42 Contour is accompanied with two ⅞" Picatinny base mounting rings. It has an illuminated 30/30 reticle and fully coated optics. The reticle color is user switchable; illuminated green, illuminated red or standard black. The illuminated colors have 5 brightness intensity settings each. The windage and elevation turrets have ¼ MOA click value adjustments. The Contour is waterproof, fogproof and shockproof and compact in size with low magnification. 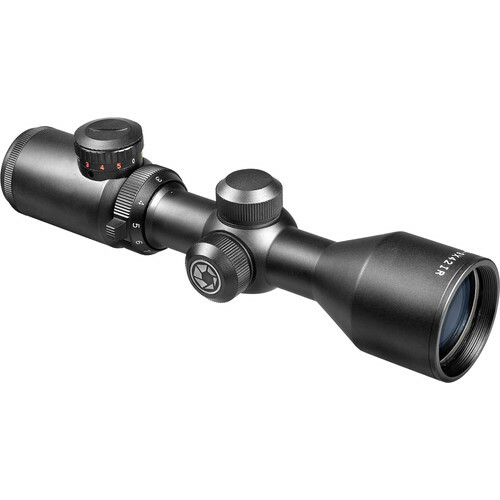 This is a very versatile riflescope for a very wide variety of shooting activities. And it is backed by Barska's Limited Lifetime Warranty. Box Dimensions (LxWxH) 10.4 x 3.5 x 3.4"
3-9x42 Contour Riflescope (Black Matte) is rated 4.0 out of 5 by 1. Rated 4 out of 5 by New AR Shooter from Nice scope for the money I mounted this scope to an AR 15 in 7.62 caliber, for hunting purposes. The scope bore sighted very easily at 25 yards and produced good groups for my eyesight and skill level. I have not tried it at longer distances yet, but hope to soon.